A skilled rider can take at least eight hours to complete this particular 58-mile EPIC. It is a tough course that includes a lot of climbing and many sandy creekbeds. Please be honest with yourself about your abilities before attempting the EPIC. Get your friends to be honest with you before you attempt this EPIC. If you reach Rincon, Sauceda or Pila de los Muchachos after their respective cut-off times, you are BEHIND the sweep rider and no longer on the supported ride …and may not make it back alive. If you are cut-off at Rincon, turn left and follow the blue flags back to the Mine. Stay left onto the Camino Viejo Trail. Ride past the Waterhole Trail (water station), the West Main Trail and the Dome Trail to arrive at Buena Suerte/Whit-Roy Mine (water and Aid Station). Through the Fresno Gate follow the pink and blue flagging up out of the Creek, onto the singletrack, across the bridge onto the Old Government Road. 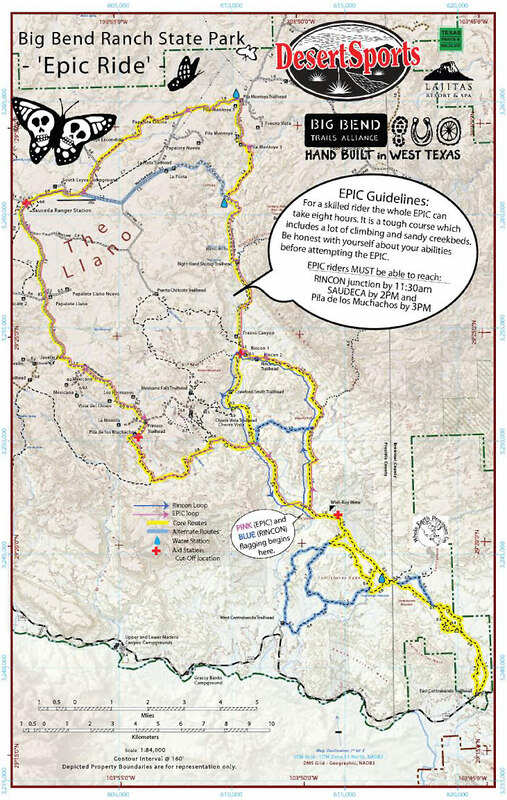 Pass the Rincon campsites, drop into the Creek to the Aid Station (11:30 am cut-off). Turn RIGHT. 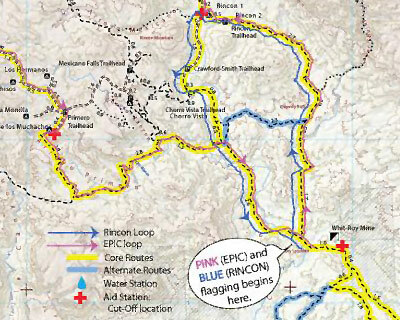 Epic Riders: follow the PINK flagging UP Fresno Canyon Road. Take the right at the Pila Montoya Trail junction and pass the Pila Montoya campsites. Stay on this road until you reach the Main Park Road. Turn left and continue for about two miles until the Papalote Encino turnout. Stay right and follow the Encino Nature Trail, which merges left with La Mota Rd. At the Main Park Road take the right. Sauceda Ranger Station! Water! (2 pm cut-off). Just past Sauceda stay left on the Javelin Road. Option: new singletrack on the left that will bypass some sandy road bits. Stay right to Pila de los Muchachos. Pila de los Muchachoas Aid Station (3 pm cut-off). Drop onto the jeep road/trail and go onto Monilla trail with a left just a short ways further and onto a singletrack that keeps you out of the creek bottom. Follow the pink flags past Madrid House, past the junction with the Rincon Loop, past the Chimney Rock Trail on your left and back down into Fresno Creek. Watch for flagging on the right taking you out of the creek. At the end of that trail you’re back on the old jeep road/trail that takes you out past the cabin and back through the Fresno Gate. Head back down the East Main Trail. Stay right on the East Main Trail and follow it back to the Trailhead. East Contrabando Trailhead! Yippeeeee! You’re done! Download a desktop printer sized map for reference.